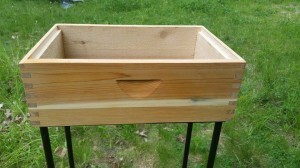 Produce DIY Custom 8 Frame Cedar beehives just like Sweet Mountain Farm or Order one from us Today! Sweet Mountain Farm harvests eastern white cedar from our abundant natural and renewable resources here in Door County and the upper peninsula. This page answers the question: why use cedar? and why build an 8 frame versus a 10 frame beehive? The following pages are devoted to each component, its use and the dimensions for each part so that you too can build your own beehives or find out more about ordering from us. 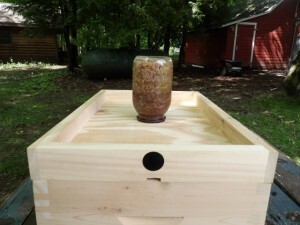 All of the qualities inherent in cedar make it an ideal match for bees and hive. I challenge you to compare materials, construction, features, and above all, optimal environments for bees. 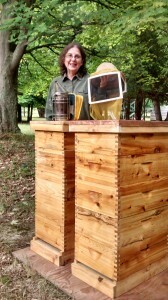 After 10 years raising honeybees in the north, I designed and created this hive for my own Russian honeybees. It is standard size Langstroth dimensions, is designed for utility as well as beauty. It is the best custom hive available. The resin produced by northern white cedar (NWC), is a natural defense against insects, mold and bacteria. NWC does not absorb water. Growing in damp, cold climates, the molecules bind closer together which produces a naturally water and rot resistant wood. The growth rate of NWC is slower than many other woods, creating lumber that does not bow or warp as much as other lumber. Since there is no chemical treatment to the wood during hive construction, we do not expose bees or honey to potentially harmful conditions. Left untreated, NWC with acquire a silver-gray patina within 5 years. If a stain is preferred, the wood will accept stain evenly. Lumber is milled from sustainable forests on a 35-70 year cycle. Cedar molecules are tightly packed creating strong bonds within the wood and large pockets of air making cedar lightweight and easier to lift when full of honey! The air between the fibers gives greater insulation against extreme temperatures making it easier for bees to regulate interior temperature. 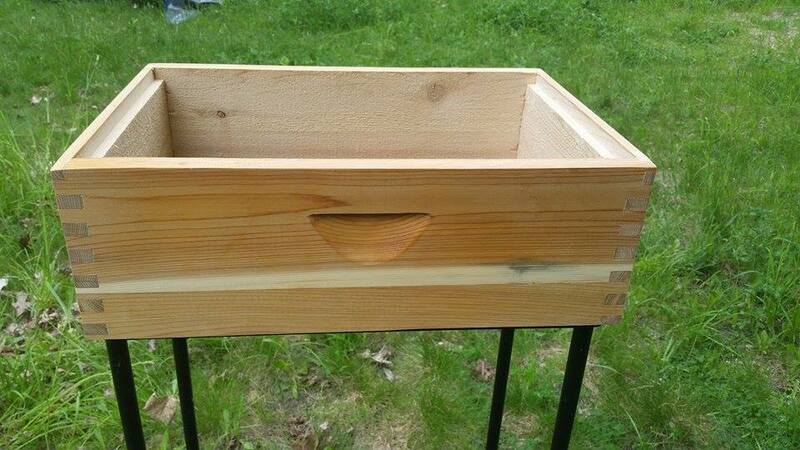 The eight frame, standard 6 5/8” medium, northern white cedar beehive is designed especially for Russian honeybees! The overwinter cluster is the size of a softball. Smaller cluster, smaller space, less heat transfer, and greater efficiency. Minimize empty frames often found on the outer frames of 10 frame hives. Less energy is used and fewer resources consumed to heat or cool empty space. Easier on the back, each box weighs under 40lbs when full of honey. Interior is rough. Honeybees smooth out rough surfaces with propolis, creating a naturally hygienic, anti-viral, anti-bacterial and anti-fungal living space. Seven symmetrical pins and tails for furniture quality beauty. Joints are tight and include 8 stainless steel screws at each corner. 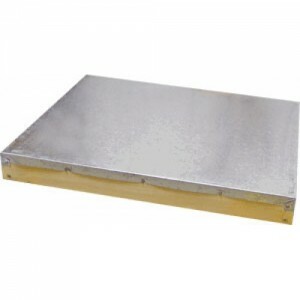 One-piece stainless screened bottom board makes ventilating the hive and monitoring mites easy; eliminates disassembling the hive to access the bottom board. 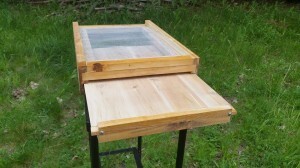 Pull tray out from the back of the hive for bee free monitoring. Tray is 100% recycled polypropylene. It does not warp, pulls out smoothly, and debris cleanup is easy. All in one, versatile multipurpose inner cover can be used as; a spacer, vent, upstairs entrance, summer and winter feeder, moisture control or division board eliminating additional equipment. Choose from an aluminum roof with heavy-duty rubber washer roofing nails or add 99.9% pure copper. Option 1: Eco-wood treatment is a naturally effective wood preservative, no-maintenance, 100% organic, non-toxic compound that will not wear off, fade or peel. It will age the cedar to a silver grey patina. Option 2: Linseed oil is a flax seed derivative used for enhancing wood grain. Apply annually to maintain the finish. Option 3: Natural – Cedar does not need a sealant. Order a natural finish or you can creatively decorate the hive. There are some common sense objections from the old time beekeeper about the honeybees not taking kindly to the cedar smell. The thinking goes something like this, “if an insect is repelled by the smell of cedar then the honeybee will be repelled.” The second objection is that honey being hygroscopic will absorb the cedar odor. These objections are simply, not true. At SMF we keep the cedar on the inside of the hive rough. It is our experience that Russian honey bees heavily propolize the interior of the hive, smoothing out the rough interior. The propolis seals off any out gassed cedar odor and creates a resistant anti-viral, anti-fungal, and anti-bacterial hive. 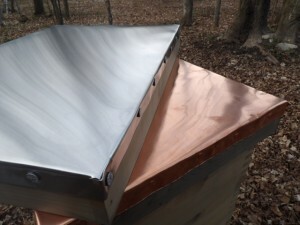 The 8 frame telescoping cover is sometimes called an outer cover and is designed to protect the hive from weather damage, it is waterproof, and covered in sheet metal. Assembled dimension is 16″ x 22”. Below is a material list for the 8 Frame telescoping cover. It helps to keep the bees from gluing the outer cover to the hive body as well as from gluing the outer cover to the top of the frames. Some beekeepers will substitute a heavy canvas cloth. 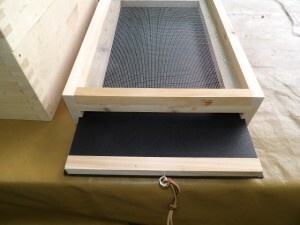 The inner cover is more gentle to the bees by creating a 1/4″ bee space between the frames and the inner cover. An inner cover has many purposes. It will help to insulate the hive creating a 1/4″ dead air space between the outer cover and the hive. SMF does not notch the inner cover for ventilation. A Popsicle stick or small stone can be used to prop the inner cover open for ventilation if needed. This way, if the hive needs to be moved, we simply staple a screen over the oval hole and screw it down onto a super at the four corners. 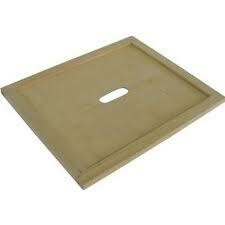 The oval hole in the inner cover can be used for feeding or it can be used in combination with a bee escape when bees need to be evacuated from a super. Never worry about the inner cover placement on the hive since our inner covers are identical on both surfaces. *Sweet Mountain Farm uses the scrap from the hive body to produce the frame for the inner cover. This dimension can be varied based upon available stock. A colony uses the first hive body to raise brood. This is the component used by the queen to lay eggs and where the young larvae are raised. Each additional body is called a honey super and is used to store pollen and nectar. Hive bodies take a lot of abuse in the field. The beekeeper uses a hive tool to pry hive bodies apart that are glued together by propolis. Propolis is a resinous substance collected by honey bees from tree buds. It is used to fill crevices. There are many sizes available in the industry although sticking to one size is recommended. The uniformity of one size makes the bee operation completely interchangeable and it is by far the most flexible configuration. An 8 frame medium hive body, when full of wax and honey, can weigh up to 40 lbs. The hive should be tough for the field, not prone to warp, rot resistant, insect resistant, and as lightweight as possible. It should reduce thermal transfer yet dissipate excessive moisture inside the hive as well as be waterproof. At Sweet Mountain Farm a winter bee feeder is used on first year splits or when honey reserves are low. A strong and healthy colony should not need to be supplemented by winter feeding. Colonies in the north need at least 60 lbs. of honey going into winter. That is equal to 12 – medium full frames of capped honey or approximately 10 deep frames. It seems counter-intuitive that prolonged warmer temperature rather than colder temperature indicates a hive may need additional resources. When temperatures reach 40 degrees a colony will break cluster and begin to consume more food. A winter season with unusually warm temperatures will be more stressful for the bees than consistently colder temperatures. The bees will break cluster, take cleansing flights and require more food to expend energy during warmer winters. Resources become depleted in the spring and therefore colonies most often starve out before nectar and pollen are available. If the population of a hive is high going into winter and and the temperatures are above average, this is the time to place a winter bee feeder on the hive. 1x4x8 lumber is used to make a frame that is 14″ x 20″. Use ¼” hardware cloth. Drill ¾” ventilation hole into the face of the frame. Position the hole just under the telescoping cover so that the outer cover will close the hole if needed. Shape the hardware cloth into the frame and staple it to the frame. The frame will hold up to 15 pounds of fondant although 5 pounds is sufficient. The basic fondant recipe is 1 pint water to 5 lbs. sugar. Boil water and sugar to soft ball stage which is 245 degrees Fahrenheit. Line the mesh hardware with newspaper or wax paper and pour the hot syrup onto the paper. 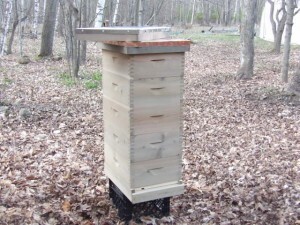 Once set, it is placed on the hive as a top feeder. Dry bee pollen can be scattered on the top of the fondant. 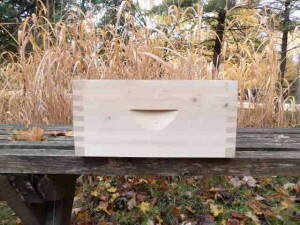 Place the hive at the Winter Solstice when daylight time begins to increase. Watch the syrup carefully. At approximately 210 degrees the liquid starts to boil and the temperature climbs fast. Do not feed your bees fondant that has been over cooked. The liquid will turn slightly brown and the bees cannot digest the over processed fondant. Discard it and start over. If you do not have a candy thermometer you can use the ice water method. Drop a teaspoon of boiling liquid into the ice water. If a small ball can be formed with the liquid the mixture is ready to pour.